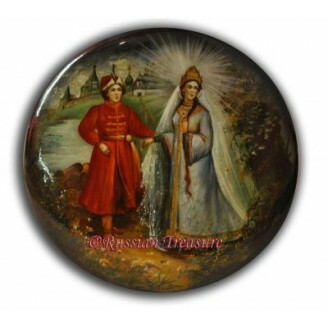 This classical lacquer box from the village of Fedoskino is a brilliant illustration of Tsar Saltan Fairytale, written by a famous Russian poet Alexander Pushkin. Being the oldest center of miniature painting, Fedoskino village is famous for its unique style and vibrant colors. Fedoskino one-of-a-style lacquer boxes are extremely popular both among collectors and amateurs. The lacquer box depicts one of the most mystic scenes of the tale – the Swan’s transformation into a beautiful Princess. Prince Gvidon is both proud and surprised; you can read this on his face. The lacquer box artist masterfully rendered the facial features and expressions of the both characters so you could feel the atmosphere of magic, excitement and deep love. Full of majesty and grace. This description of the Princess Swan is illustrated on the lacquer box in the best possible way. To emphasize the magic of moment, the artist used mother-of-pearl while painting the Princess. This depiction of the Princess Swan is very striking. The moon in her braids gazes quietly into her beloved Gvidon's eyes. What is peculiar for this classical Fedoshkino lacquer box is magnificent detalization of tiniest objects, just look at the mother-of-pearl flowers charmingly glimmering underfoot, or lovely Gvidon’s Tsarstvo in the distance. Egg-tempera paint is the main medium used to paint this lacquer box composition. The palette is very characteristic of Fedoskino work, which is bright, bold, and easily distinguishes the action in the scene. High-quality paper-mache is decorated on the sides with elegant affected gold ornament. Black lacquer covers the exterior and red lacquer covers the interior of the box. This unique Fedoskino lacquer box was made and imported from Russia exclusively for Russian Treasure store; you’ll never find the item of such quality anywhere else. Don’t miss a chance to own your own treasure. This lacquer box will be a brilliant and meaningful St. Valentine’s gift for the person you love!